The Senate confirmed Elena Kagan Thursday as the Supreme Court's 112th justice and fourth woman, selecting a scholar with a reputation for brilliance, a dry sense of humor and a liberal legal bent. Responding to the vote, President Obama said Elena Kagan's confirmation was an affirmation of her character and judicial tempermant. Obama, who was in Chicago doing Democratic fundraisers, said he was confident she'll be an outstanding justice. Kagan watched the vote from the Solicitor General's conference room with her friends and colleagues at the Justice Department, reports CBS News White House correspondent Mark Knoller. Kagan isn't expected to alter the ideological balance of the court, where Stevens was considered a leader of the liberals. Her lack of judicial experience was the stated reason for one fence-sitting Republican, Sen. Scott Brown of Massachusetts, to announce his opposition to her confirmation Thursday, just hours before the vote. Though calling her "brilliant," Brown - who had been seen as a potential GOP supporter - said she was missing the necessary background to serve as a justice. Democrats said Kagan could help bring consensus to the polarized court and act as a counterweight to the conservative majority that's dominated in recent years. With her confirmation, Sen. Chuck Schumer, D-N.Y., said near the end of a three-day debate, "average Americans will be a step closer to once again having their voices heard in the highest court in the land." 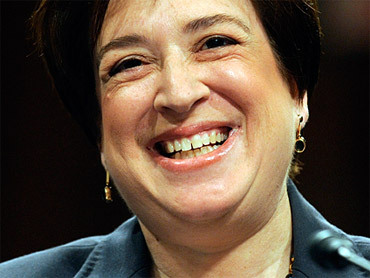 Most Republicans portrayed Kagan as a politically motivated nominee who would allow her liberal views to interfere with her rulings, and use her post to push the Democratic agenda from the bench. Kagan "is truly a person of the political left - now they call themselves progressives - one who has a history of working to advance the values of the left wing of the Democratic Party, and whose philosophy of judging allows a judge to utilize the power of their office to advance their vision for what America should be," said Sen. Jeff Sessions of Alabama, the top Republican on the Judiciary Committee. Still, it was clear that unlike in past decades - when high court nominees enjoyed the support of large majorities on both sides - party politics was driving the debate and vote on Kagan, much as it did last year when the Senate considered Obama's first pick, Justice Sonia Sotomayor, and former President George W. Bush's two nominees, Chief Justice John Roberts and Justice Samuel Alito. GOP senators have criticized Kagan for her decision as dean to bar military recruiters from the Harvard Law School career services office because of the prohibition against openly gay soldiers. Republicans spent the last hours of debate accusing her of being hostile to gun rights, and they have also spent considerable time criticizing her stance in favor of abortion rights. Kagan revealed little about what kind of justice she would be in weeks of private one-on-one meetings with senators and several days of testimony before the Judiciary panel, despite having famously penned a law review article blasting Supreme Court nominees for obfuscating before the Senate. She dodged questions about her personal beliefs on a host of hot-button issues and declined repeatedly to "grade" Supreme Court rulings. But her public appearances and documents unearthed from her time serving as a Clinton administration lawyer and domestic policy aide painted a portrait of the kind of personality she'll bring to the bench. She came across as a sharp intellect who enjoys the thrust and parry of legal debate, someone who's willing to throw elbows to make her opinions heard but nonetheless eager to facilitate consensus. Kagan will be no stranger to the eight justices she is to join on the Supreme Court, having served as the government's top lawyer arguing cases before them in a post often referred to as the "10th justice." She's already friendly with a number of them, not least Antonin Scalia, the conservative justice who is her ideological opposite. Kagan's nomination to a lifetime seat on the nation's highest court has drawn relatively little notice this summer, with the public and elected officials preoccupied by bad economic news and the Gulf oil spill, and many lawmakers nervously eyeing the November midterm congressional elections. But senators used the debate to press dueling visions of the Supreme Court. Democrats say Kagan would be a mainstream, moderate counterweight to a conservative majority they say has defied Congress and ignored the Constitution in its rulings on issues such as workplace rights and campaign finance. Republicans argued that Obama's choice of Kagan reflects Democratic attempts to pack courts with liberals who will mold the law to their agendas. When sworn in, Kagan will join two other women on the court, Ruth Bader Ginsburg and Sotomayor, who was Obama's first nominee. Sandra Day O'Connor was the first woman appointed to the court, by President Ronald Reagan. She served from September 1981 to January 2006.